These days, law firms have a lot on their plate aside from practicing law. In the past, referrals were generally enough to carry on a practice. However, in the current market, you must compete with DIY services along with on-demand paralegals and other alternative legal suppliers. This means that marketing has become even more important for your ongoing strategy. However, given the plethora of options, selecting the ideal combination of technology and tools is not easy. To make things a little more comprehensible and digestible, here are three of the most beneficial Law Firm Marketing Tools For Lawyers for you to take into consideration. But first, let’s briefly touch on the importance of Law Firm Marketing Automation. Reduces expenses by automating repetitive processes. Enhances productivity by allowing employees to focus on tasks that need specialized attention. Improves customer satisfaction by proactively communicating with them on a regular basis. Delivering automated emails improves your chances of staying top of mind with a prospective client by more than 130%. Prospective clients are around 120% more likely to open emails the second or third time they receive one from you compared to the first time. Use it internally to send reminders to lawyers and other staff regarding time-sensitive events such as meetings and court hearings. Send polite reminders to clients regarding forms they need to fill out or documents that they need to bring in to court hearings and appointments. 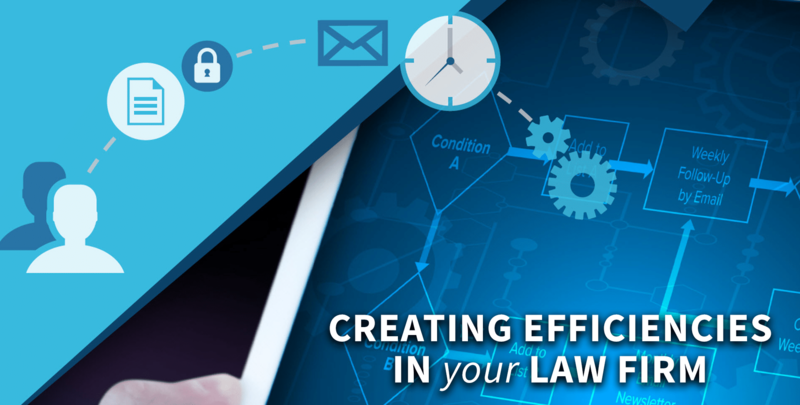 All in all, automating your Law Firm Marketing has a lot to offer since it saves both time and money by allowing daily tasks to be handled automatically without any human interaction. If you have any pressing questions or would like to know more about Law Firm Marketing technology, feel free to reach out to one of our Law Firm Marketing specialists today and we’d be happy to help.